The Valuation Office Agency already have records of all commercial land and buildings for Business Rates purposes, so that requires minor tweaks only, in this section I will outline how residential land could/should be valued. 1. Estimating the total tax base for UK residential land. Their total number of units in England & Wales agrees to the total number of homes for which a Council Tax valuation exists. We could at this stage simply say, as at January 2015, the current land-only rental value of £200 billion is 3.5% of the total value of all housing, so the land-only rental value of each home will be +/- 3.5% of its selling price, and, subject to a few caveats as explained below, this is surprisingly accurate. 1. The headline figures for the three main house price indices (Nationwide, Halifax and HM Land Registry) of (currently £188,000; £189,000 and £177,000) are not simple mathematical averages, the first two are based on a historic hypothetical figure indexed up for price changes and HM Land Registry is based on the geometric mean rather than the simply mathematical average. To cut a long story short, their headline figures are much lower than the true average. 2. 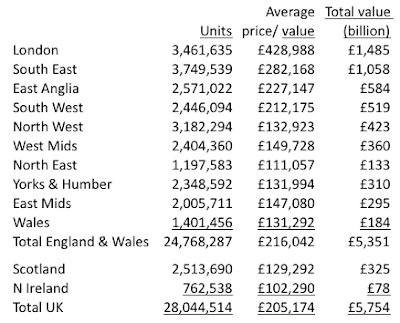 Savills' average value for England & Wales of £216,000 is one-sixth lower than a simple average of all prices paid in England & Wales reported by HM Land Registry in the calendar year 2014. If the average land-only rental value is 3.5% of Savills' lower figure then it is only 2.9% of the higher average price paid according to HM Land Registry. 2. 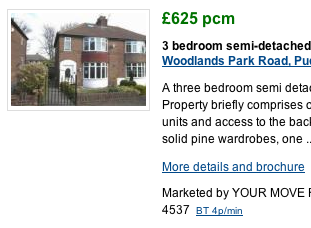 "Land-only rental" value or "site premium". 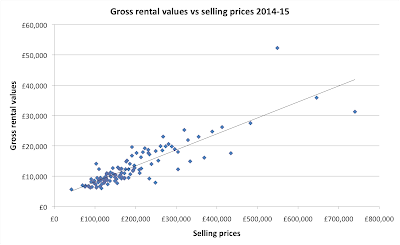 In an ideal world, Land Value Tax is based on the land-only element of the rental value of each plot. 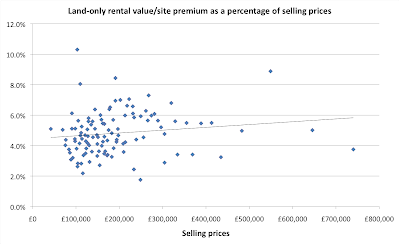 The nay-sayers hit back by saying that if you have a plot of land with no building on it, its rental value will be negligible, which is why I refer to the "site premium". i.e. 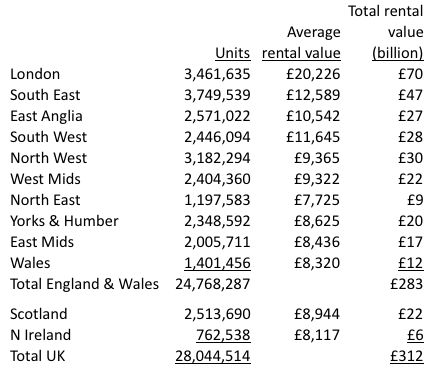 physically identical buildings (for example, a three-bed semi-detached house) in different parts of the UK will have different rental values. 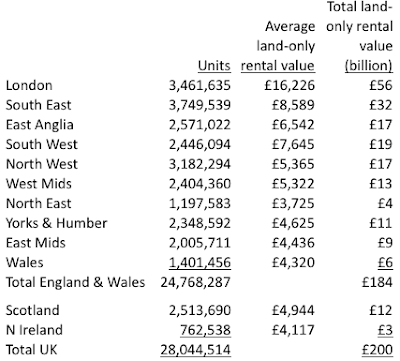 The extra rent commanded by the more expensive ones is down to the "location, location, location" and that is the "site premium" and the tax base for LVT. Alternatively, we can establish the gross annual rental value and deduct an estimate of running costs, of say £4,000 for a semi-detached house with correspondingly smaller or larger amounts for smaller or larger homes. Once we've established the site premium for the first house, the rest is just subtraction. 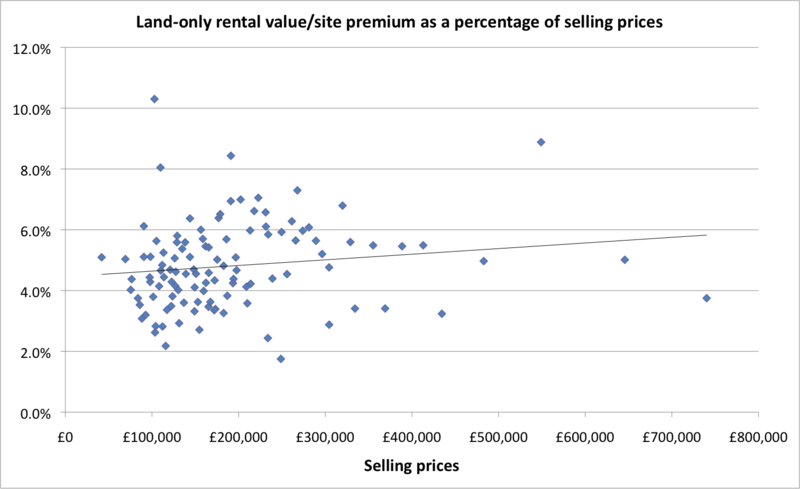 The difference in rental values relates purely to the "location, location, location"/the site premium. 3. Using recent selling prices as a guide to rental values. HM Land Registry now make all their price paid data for England and Wales available for free online, showing the full address and postcode and split into selling prices for flats, terraced houses, semi-detached and detached houses. The co-efficient of correlation is 0.87, which is high enough for these purposes. 0.0 = no correlation, 1.0 = perfect correlation. Whether the outliers are just outliers or whether some of the underlying data is inaccurate is unknown, but this will do to illustrate the principle. Using the last twelve months' data gives us 300 to 400 sales in each postcode district, or 100 sales in each smaller postcode sector. Obviously, there is a trade-off between using selling prices for the last twelve months and for longer periods. If you use longer periods, then you have a bigger sample size but if prices have changed a lot, then the older prices themselves will be less indicative. 4. Adapting the Council Tax system. Step 1: Each council works out what it wants/needs to spend and subtracts its central government grants to give a small balancing figure to be collected in Council Tax. Step 2: The council ranks all homes in its area by size/value, so the smallest flats in an area count as two-thirds of unit of housing (Band A) and the largest detached ones count as two units (Band H). Step 3: The council adds up the resulting number of units of housing. Step 4: The council divides the required tax (from Step 1) by the total number of units (from Step 3) and that is the tax on homes which count as one unit (i.e. 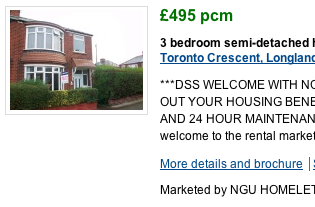 semi-detached homes or large terraced houses, Band D). So a small flat in Band A pays two-thirds as much as a normal semi in Band D; and the largest detached houses in Band H pay twice as much. a) There is no need to value each individual home; this is expensive and leads to too many arguments; further, Land Value Tax is based on the site premium element of each plot-with-planning and completely ignores whether an individual home is well-maintained/has an extension/loft conversion or whether it is dilapidated/derelict. Each 'home' is unique and special; shapes drawn on a map are not. b) It is only relative and not absolute values which matter. For example, if you are in a room with a dozen people all milling around and you have to guess how tall each one is in feet and inches, you'd struggle, but getting them to line up tallest on the left, shortest on the right is easy enough. If you are then told that somebody in the middle of the row is 5'6" tall, you can easily guess how tall the others are. So you have to start in the middle and work outwards! 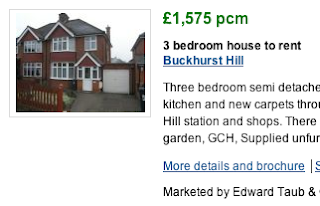 c) We can easily establish the site-only rental value of a bellwether 3-bed semi-detached house in a typical residential area - see examples in 2. above - and we can just express all other homes relative to that. (Clearly, this approach can be adapted to atypical residential areas i.e. in an inner-urban area with predominantly terraced houses and flats and barely any detached houses, we might take a terraced house or a 3-bed flat as our bellwether Band D home; in a rural area with barely any flats, a detached house with a certain sized garden might serve best as the Band D home with small terraced cottages originally built for farm workers (and anything smaller than that) are put into Band A). - in the very cheapest areas, Band D tax is £900 a year; Band A tax (studio flat) is £450; Band H tax for very large detached homes/plots is £1,800. - in median areas, Band D tax is £6,000; Band A tax (studio flat) is £3,000; Band H tax is £12,000. - in a top decile area, Band D tax is £14,000; Band A tax (studio flat) is £7,000; Band H tax is £28,000. 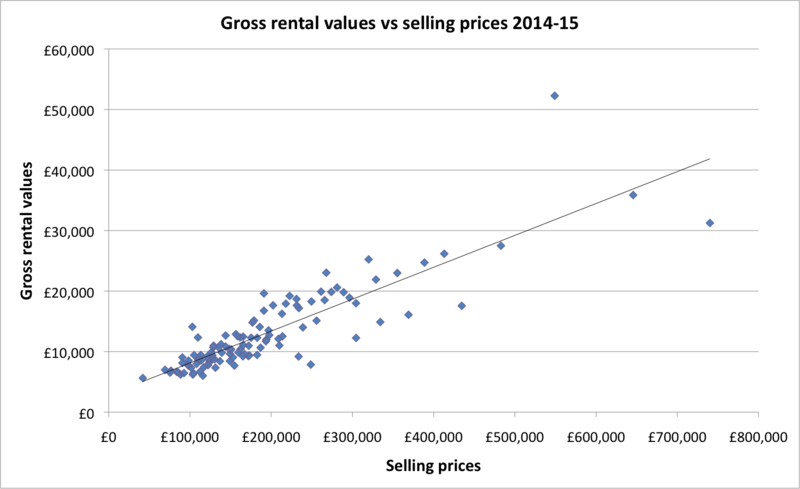 Having done the exercise, you then compare the results with actual market rents and rental values implied by selling prices, i.e. how much people are with small deposits have to pay in annual mortgage payments plus Council Tax, and shuffle homes at the edges of each Band up and down accordingly to get a reasonably satisfactory result - as John Maynard Keynes said, "It is better to be roughly right than precisely wrong". 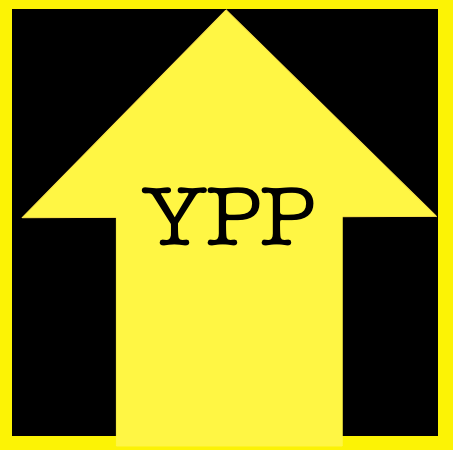 - we can adopt a points-based system, for example one point for every 50 sq yards of land occupied (so a flat in a high rise block gets half as many points as a similar flat in a low-rise building); one point for each habitable room or off-street parking space; adding an extra two points for homes facing a park; adding two points for homes within 500 yards of the nearest station and deducting two points for those more than a mile away. ... each with their advantages and disadvantages, so there is no point pretending that any method gives us some scientifically verifiable figure accurate to three or four decimal places, so it makes sense to put homes into Bands (like Council Tax bands) and all homes/plots in the same Band in the same valuation area pay the same LVT. Simply using the Council Tax bands, with a ratio of 3-to-1 between the largest and smallest homes/plots probably does not capture the full range, but has the advantage of simplicity. I personally would prefer to end up with many more, narrower bands, let's say twelve bands each 20% wide. So instead of having lowest Band A being 6/9 and highest Band H being 18/9, lowest Band A would be 4/9 and highest Band M would be 36/9, and the ratio would be 9-to-1.. This makes the initial valuations a bit more complicated, but this is still only a one-off cost. Clearly, a few homes at the very bottom end will end up being slightly 'overtaxed' and a few at the very top end will still be slightly 'under taxed' but those are acceptable losses - worst case, the tax would act like a progressive poll tax. Yes, we have to accept that there will be a flurry of appeals against the initial assessments/Banding. a) If we use the concept of relative values/banding as explained above, the valuation authority can be relatively relaxed about allowing appeals during the initial assessment stage; if half of people appeal and half of those get their home/plot shifted down a band, then the equivalised number of units of housing goes down, but the tax rate can be nudged up to keep total revenues constant. b) Banding reduces the number of appeals, even if the result is a bit arbitrary in some cases. If each individual home is given a precise £ value, then it is always worth putting in an appeal. With Banding, the appellant will have to show that the rules have not been applied consistently (i.e. there was a mathematical mistake) and/or that the home/plot in question is in fact much smaller than assumed, or suffers from some particular factor, i.e. is next to an electricity sub-station etc, which means that it should be in a lower Band (i.e. that the correctly calculated value is about twenty per cent lower than the originally assessed value). c) Only those who own a home at the time of the original valuation/Banding will be allowed to appeal within the next 12 months. Future purchasers will be deemed to have accepted that the Banding is correct at the time they buy a home; even if the tax is objectively 'too high', that will be reflected in a lower purchase price so they have already got their money back. The tax on other homes might turn out to have been assessed 'too low', which is a one-off windfall gain for the current owner. According to Communities Secretary Eric Pickles' estimate, doing a revaluation for Council Tax would cost £280 million, i.e. 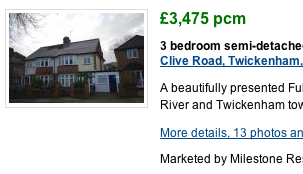 about £10 per home. It might cost a few hundred pounds if there is an appeal (which is less than people pay to have an accountant prepare their Self-Assessment tax return prepared year in, year out). Once upon a time, way back in 1991, in time for the launch of its new council tax system, the Government needed every property in the land to be put in a valuation band. 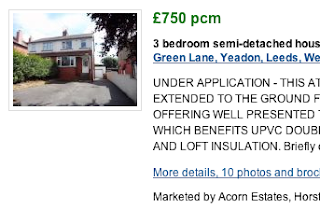 But time was short, and the job large, so the people in charge asked estate agents and others to help. Yet even with all the estate agents' help, they didn't have time to get the detailed information together, so they set about doing it quick by pairing up and driving down countless streets, allocating each property a band with just a glance. They became known as “second gear valuations” as they never even stopped their cars, never mind got out of them. Further, the initial valuations/Banding is a one-off cost. - If we significantly reduce taxes on earned income (by £200 billion), disposable incomes of tenants and first-time buyers increases and a lot of that increase will flow through into higher rental values. So even if a few of the initial assessments are a bit toppy, after a couple of years, even those will objectively be on the low side and things will quieten down. - If more tax is collected from land values and less is collected from output, wages and profits, then selling prices will change. They might go up (because of boost to economy), they might go down (a tax on land depresses its selling price), the two effects might cancel out, this is irrelevant in the long run.